The Polish Baroque ensemble Arte dei Suonatori and recorder soloist Bolette Roed to present new CD on the occasion of their New York debut on 8th October. The Polish Baroque ensemble Arte dei Suonatori and Danish recorder soloist Bolette Roed to present new CD on the occasion of their New York debut on 8th October. The award-winning Polish Baroque ensemble Arte dei Suonatori, who is to make their New York debut at the Morgan Library and Museum on 8th October at, will be presenting their first CD recording with Danish recorder soloist Bolette Roed - Royal Recorder Concertos - on the same occasion. Following the concert, Ms. Roed will meet the audience for a CD signing session. For both the Morgan Library concert and the new CD, Ms. Roed and the ensemble are excited to present rare Baroque repertoire from the European treasuries. The concert programme has a Polish angle reflecting the ensemble’s background, whereas the CD premieres the soloist’s own find from the Court of her native Kingdom. For her first CD recording as a soloist, Bolette Roed wished to focus on the musical riches found in Denmark in the time of King Fred­e­rik IV at the beginning of the 1700s: music that sounded at the court, for example at Frederiksberg Pal­ace, Copenhagen, where the music-loving King housed German Baroque mas­t­ers like Christoph Graupner, Johann Adolph Scheibeand Johann Gottlieb Graun. They all wrote recorder concertos that are among the most beautiful of the Baroque and which also herald the transition to early Classicism - as well as sounding brilliant to this day. 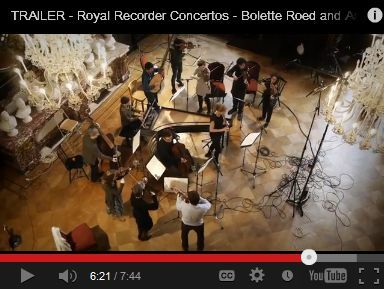 On her journey back in time towards the Danish Baroque, Ms. Roed made a remarkable find. Following in the tracks of Frederik IV’s daughter Princess Charlotte Amalie, the Princess’ own collection of music emerged at the Royal Danish Library. Inside it, large quantities of Royal dance music appeared, the best pieces of which have now been picked out, re-arranged and put together in a ‘Princess suite’ especially for this world premiere recording. It is in fact the front cover of the Princess’s music collection that graces the cover of the new CD, recorded with the Polish Baroque in grand surroundings with royal acoustics at the palace of Pszczyna in Poland.